Like other Christmas crazy folks out there each year I plan a different color palette for my decorations and wrapping. 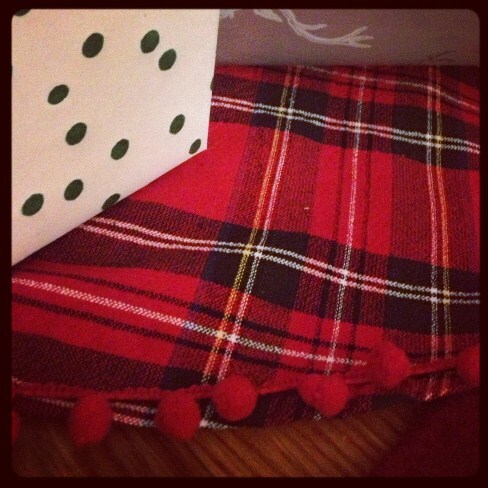 This year I decided to go back to an old standard, red, green, silver, gold & tartan! I start searching for ideas for tree skirts, mantle decor and wrapping paper early in November. Yes, I am totally that crazy lady asking the folks at Homegoods when the Christmas wrapping paper is going to hit shelves. I purchased early and planned out my wrapping combination. 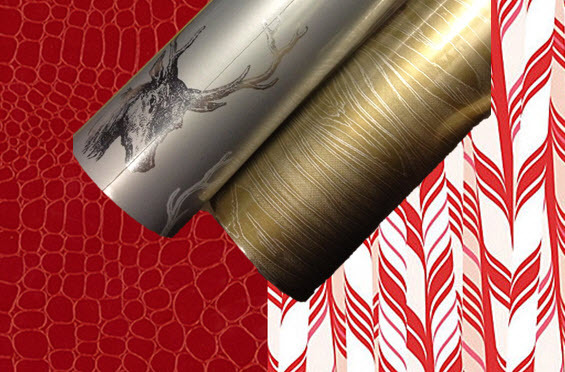 I had red faux crocodile, silver stag heads, candy cane print and gold faux bois. But after putting them all together I realized something was missing... something more than just ribbon. It was green wrapping paper! 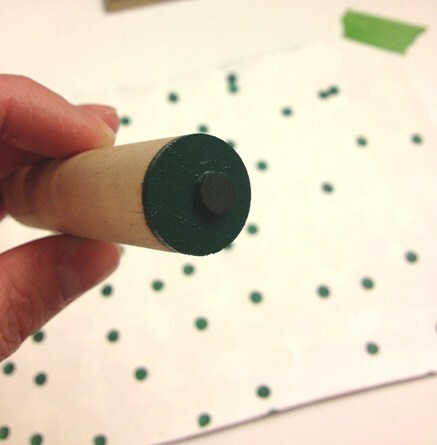 After hitting the stores again I just couldn't find what I was looking for, a matte paper with a simple green pattern. A DIY project was in order, I had to make my own. 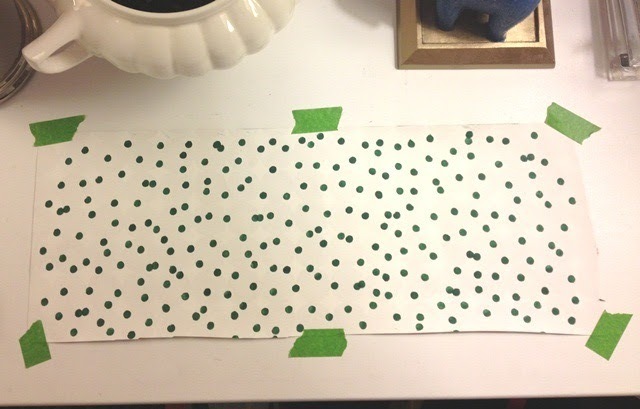 I had left over wrapping paper from last year, so using Frog Tape I secured it to my desk with the plain white side up. 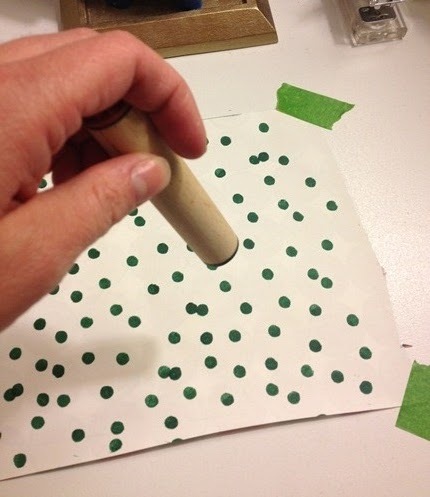 With my single polka dot stamp I went to town stamping all over the sheet of wrapping paper. A smart person might go out and get one of those polka dot sheet stamps, but I used what I had. I didn't let the first sheet dry long enough and ended up with green hands. 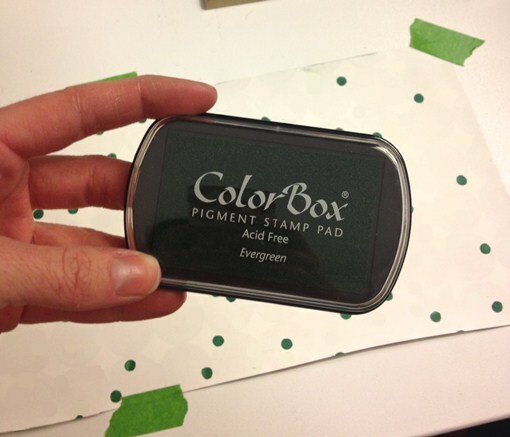 So do yourself a favor and let this dry overnight, if not longer so the ink is good and set. 10 more shopping days till Christmas!! I love how excited you get when you get an idea. You are always "spot on" perfect! Now I feel like the worst gift giver ever. This was a great idea. I'll bookmark it for next year. Hey hey, what size tablecloth did you use for your tree skirt project? Thanks!! Sarah, I used a 60" round tablecloth. It was cotton so I washed and dried it before I started sewing and it shrunk a ton. If you are going to wash and dry, I might suggest a 70" if you can find one :) I cant wait to see yours! Oh, how adorable ~ love polka dot anything!! !